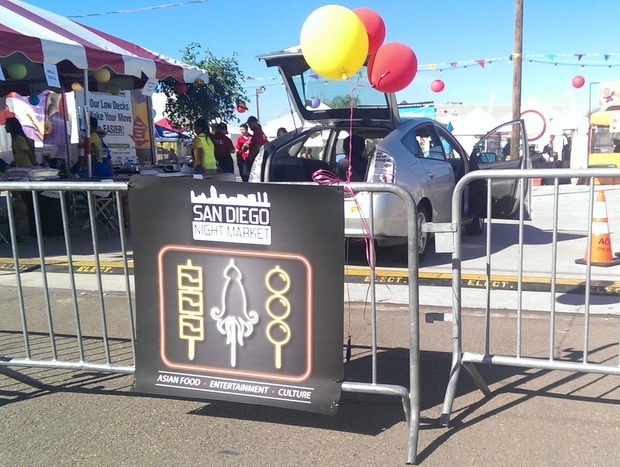 This past Saturday was the San Diego Night Market, an open air market inspired by the ones throughout Asia. This is the second year that the market has taken place. We attended the event last year and didn’t have much fun, but this year promised to be better. The Convoy District really learned from the previous year, securing a new location, a designated parking lot with free shuttle buses, etc. Heck, they even managed to have the mayor of San Diego, Kevin Faulconer, present to officially start the event. To ensure that we would have a better experience, we also had our own game plan. We arrived early, before doors even opened for the event, so that we’d be one of the first to get inside. 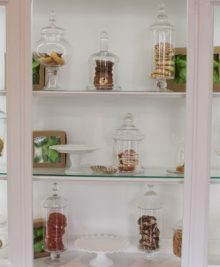 I had already researched all the food vendors and what they would be offering, and we had plans to split up to reach as many as vendors as possible, before reconvening and sharing the food. There were about 50 vendors present, with about two dozen offering food and drinks. 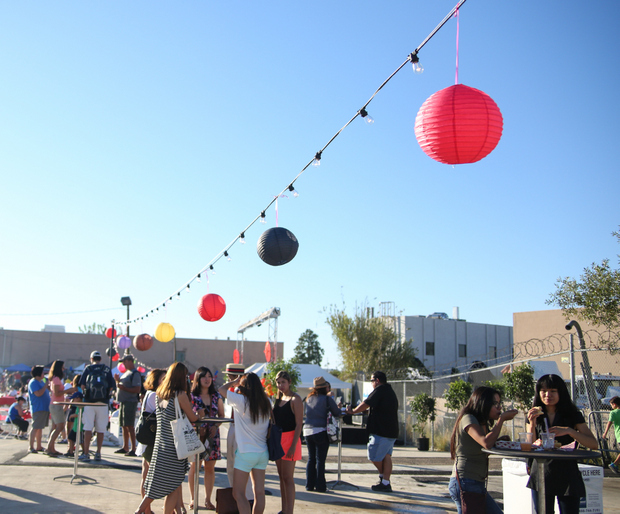 Many were local businesses and some were night market only vendors that I’ve also seen at the 626 night market. 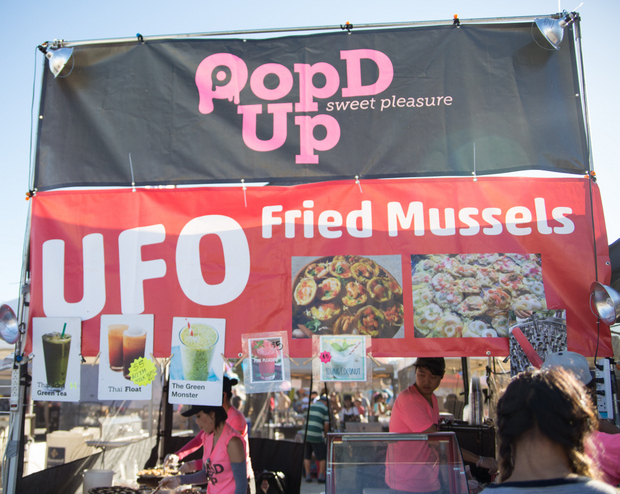 We tried to tackle the food vendors that were either offering something unique or something that fits in with the night market theme. 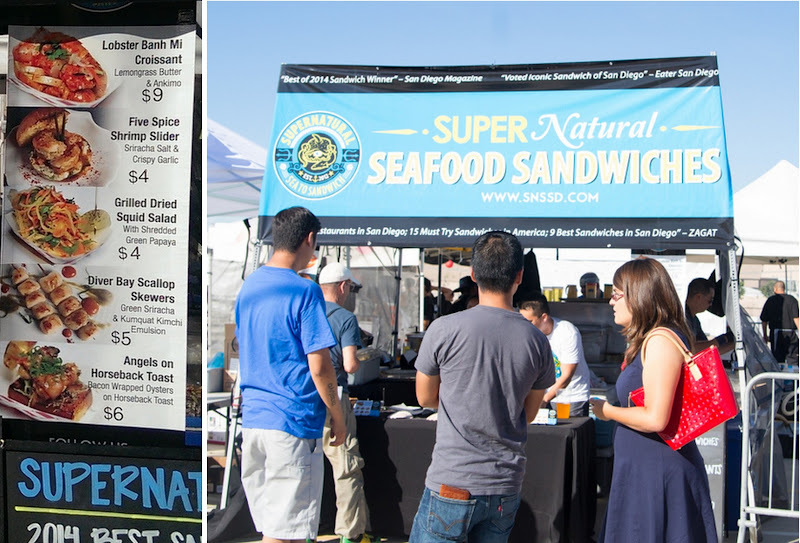 Supernatural Sandwiches, one of my favorite sandwich shops in San Diego, offered a mouthwatering menu of night market themed items that they don’t normally serve. 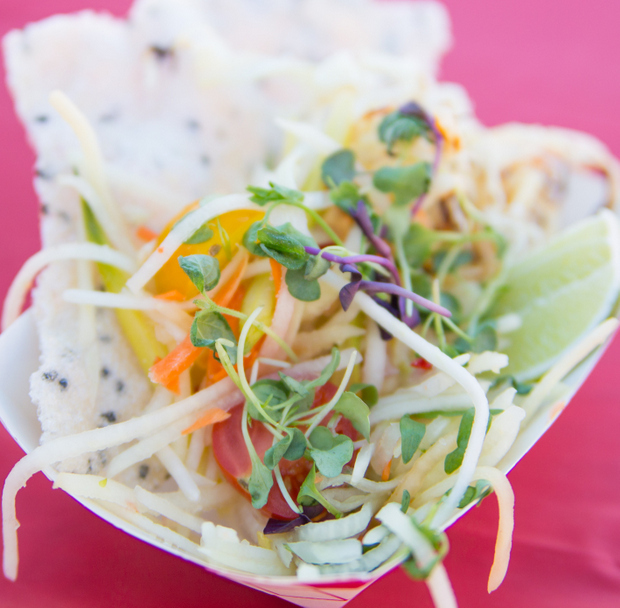 My favorite bite of the night was this Thai-style salad. 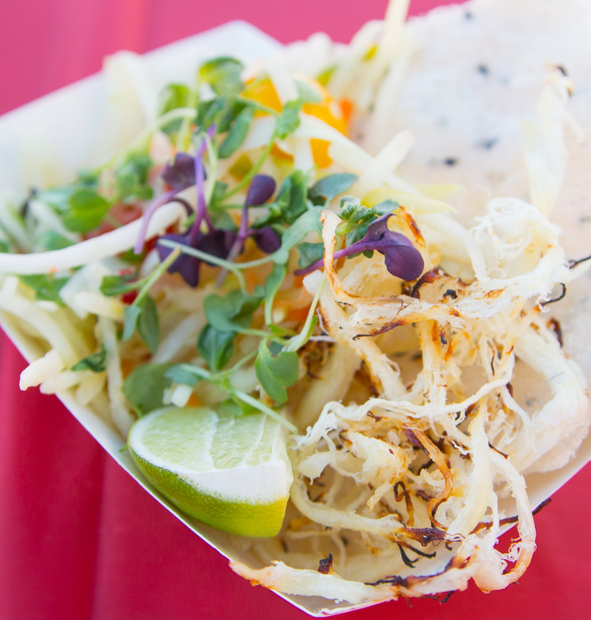 The spicy salad was refreshing and light, filled with tender crisp strips of green papaya. I loved the addition of the grilled dried squid. I hope they make this a permanent menu item. 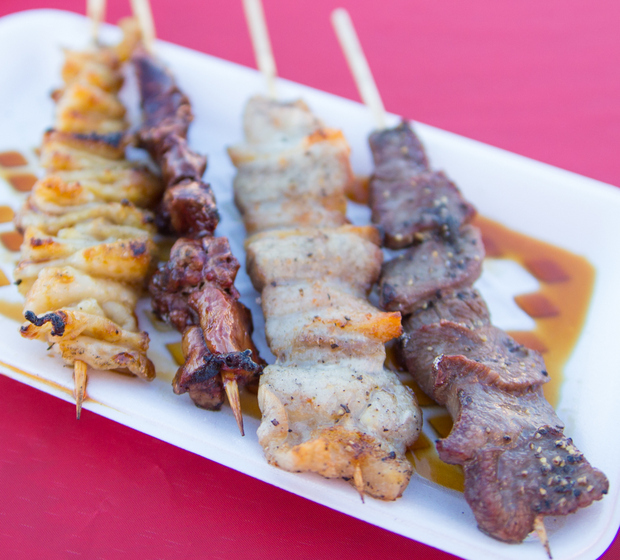 What’s a night market without skewers? 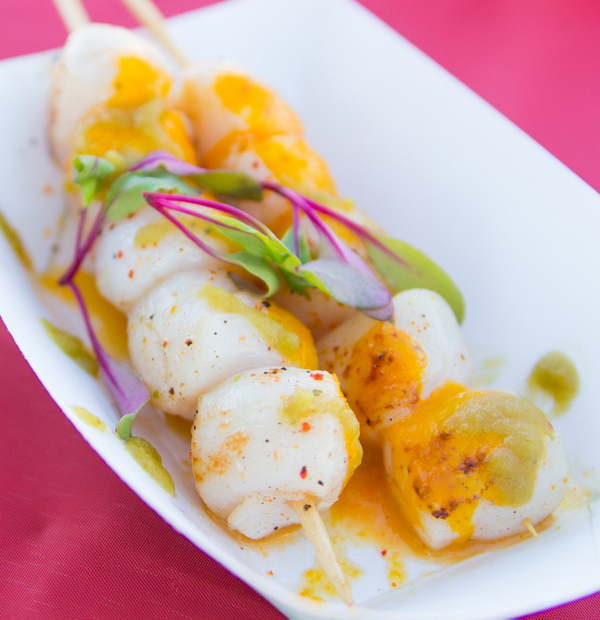 The plump scallops were marinated with a spicy green sriracha and a sweet kumquat emulsion that gave it a tropical feel. Of all the items being offered, this actually had been the one I was looking forward to most, but was my least favorite of the trio of offerings we had at Supernatural. 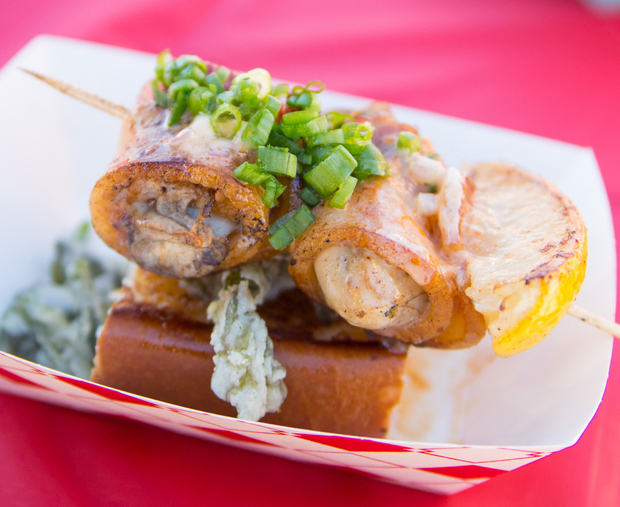 The dish consists of bacon wrapped oysters served on thick toast. The oysters were quite briny and the thick-cut bacon slices could have used a little more time on the grill to render off some of the fat and make it more crispy. 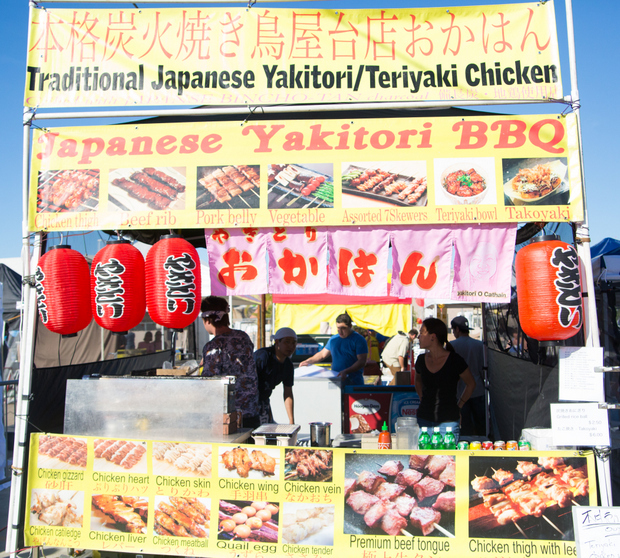 This was one of the busiest booths since they were the only one offering a variety of skewers. The skewers were alright. They were seasoned and had a good balance of smokiness from the grill, but they weren’t anything special. I wished the chicken skin had been more crispy. This stand offered a variety of Thai dishes and drinks. We ordered their signature item. The mussels are fried in a gelatinous starchy batter that reminded me of the Taiwanese oyster pancakes. They were even served with a similar dipping sauce. 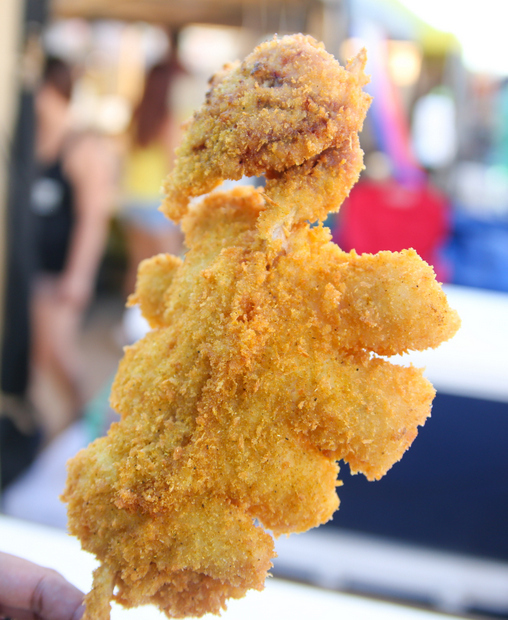 We had seen this one at 626; they are famous for their enormous fried squid on a stick. We previously had passed on it, but this time we decided to get one. Look how ridiculously big this is! Unfortunately, it wasn’t very good. The batter had a light curry flavor (the flavor we chose), but the squid itself had no flavor at all. It was also very difficult to eat and the fried batter immediately separates from the squid once you bite down. 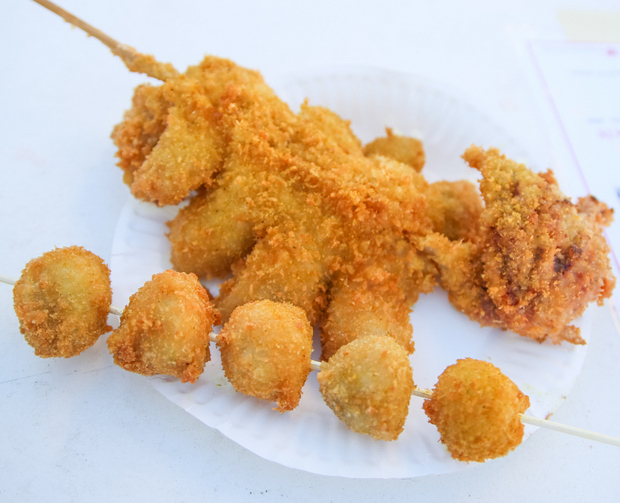 We preferred the squid roe balls, except that no one warned us that they were filled with a piping hot liquid. Once we bit in, the liquid squirted everywhere, and it was burning hot. 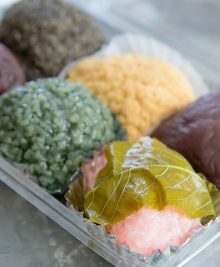 The roe balls were basically giant fish balls with little roe eggs embedded inside. The batter had a good amount of curry flavor. 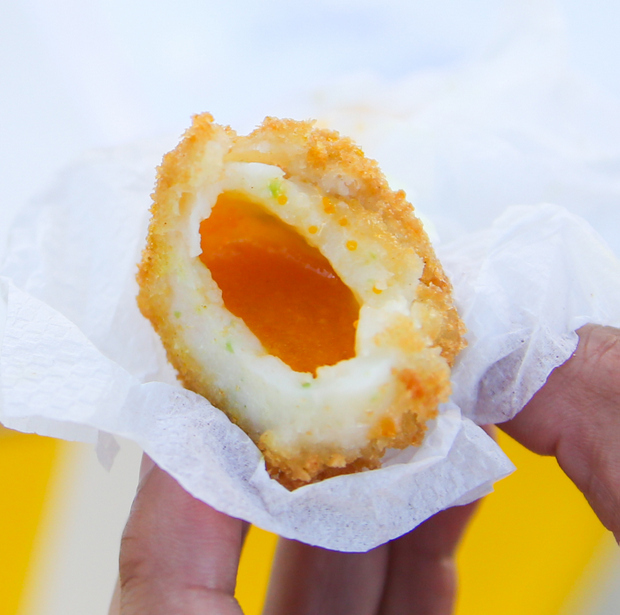 The center of the fish balls are hollow and were filled with more curry flavored liquid. I somehow missed the name of this stand but they were offering traditional takoyaki and ebi (shrimp) takoyaki. Unfortunately, we found the batter to be too soft and mushy. 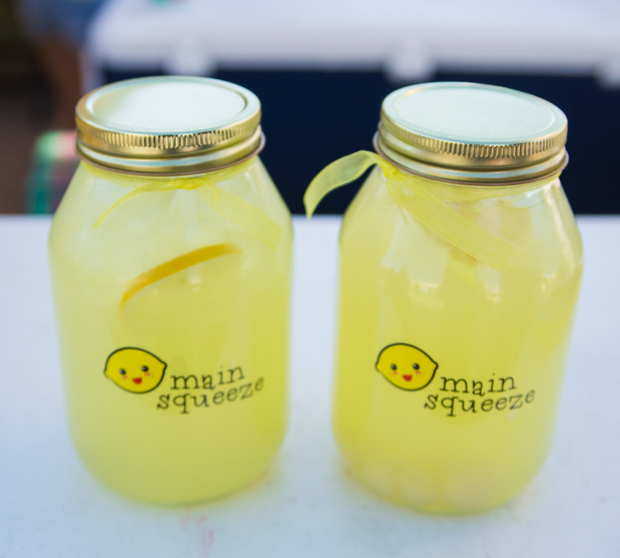 The Main Squeeze lemonade stand offers flavored lemonades in giant mason jars. With the 90+ degrees heat, this was a welcome sight. These were quite big, I wish I had put something next to them for a size comparison. 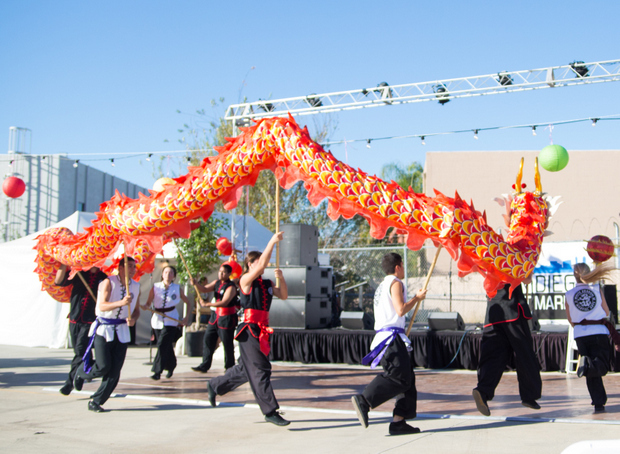 There was a full schedule of various performances and shows taking place on the stage area, including dragon dancers, cooking demonstrations and more. 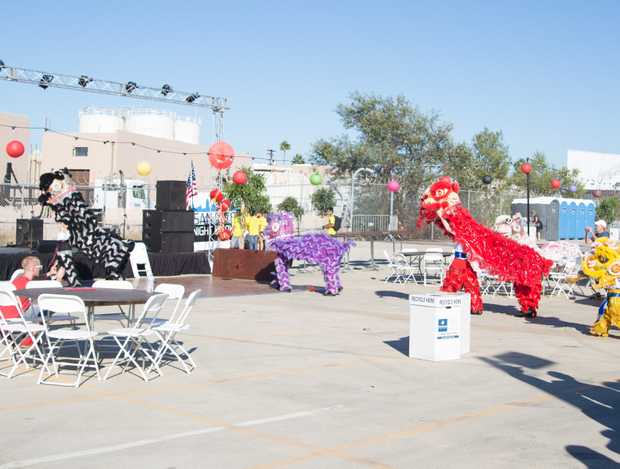 There were also a variety of non-food vendors such as toy vendors and more. The Asian Film Festival booth was one of my favorites because they were selling lemonade in adorable ninja bottles and ninja lollipops. 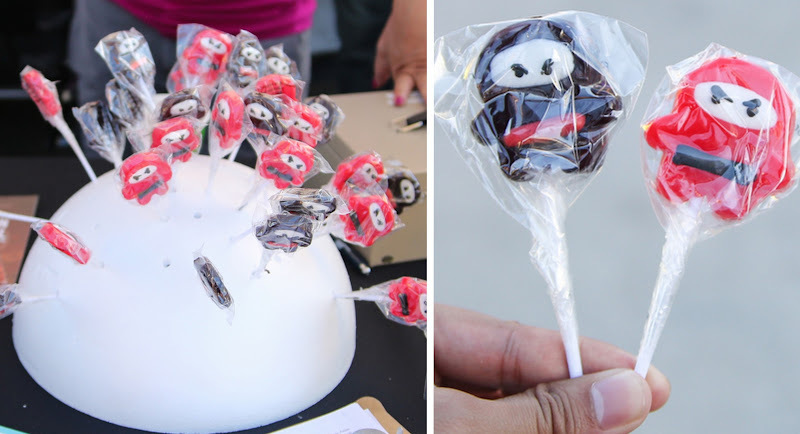 You could get a free ninja lollipop simply by signing up for their newsletter. So cute! 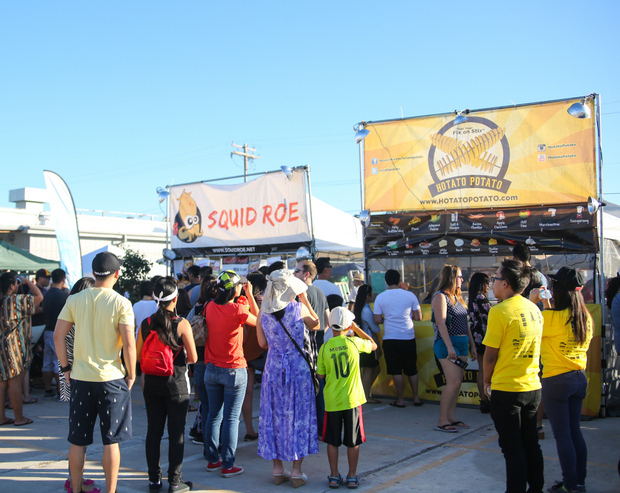 Overall, things were much improved from last year but as we were leaving, we saw that the crowds had increased considerably and the food lines were extremely long. I’m not sure how the rest of the night market experience went later in the night. Positives: I love the concept of having a night market in San Diego, especially since I’ve always had fun at the ones in Taiwan. 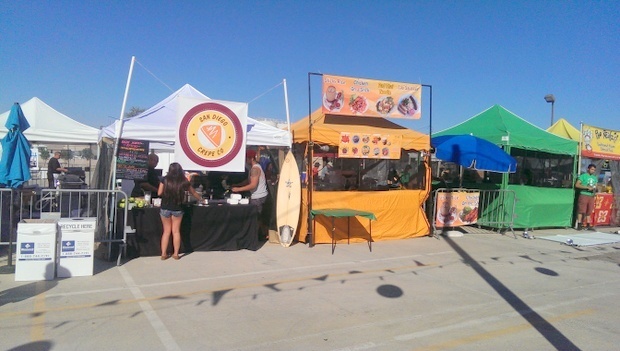 The nice weather in San Diego makes it ideal for a night market experience multiple times a year. While this was only a fraction of the night market experience in Asia or even compared to the 626 market, I do hope they will continue to improve and expand. 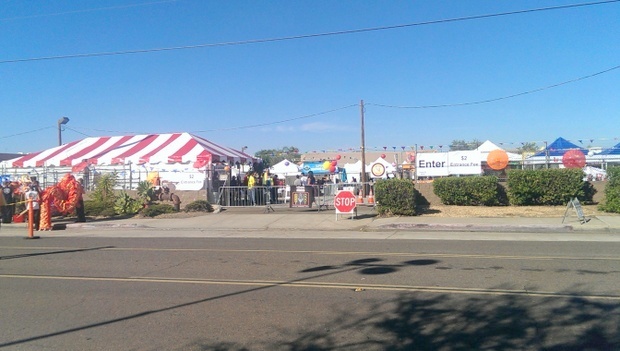 Already, we saw a lot of improvements this year with organization and bringing in more vendors. Negatives: It was an extremely hot and sunny day and there was no shade in sight. While it’s a night market, the doors opened at 4 pm and the sun doesn’t set until after 6:30 pm. I hope they put umbrellas over the tables next year so that people can get some relief from the sun. I would have also liked to have seen the food vendors already have some dishes ready when the doors opened. We were one of the first in line at each of the stands and had to wait another 10-15 minutes while they made the food. I can only imagine how much this wait time got compounded later on in the evening when things got really busy. 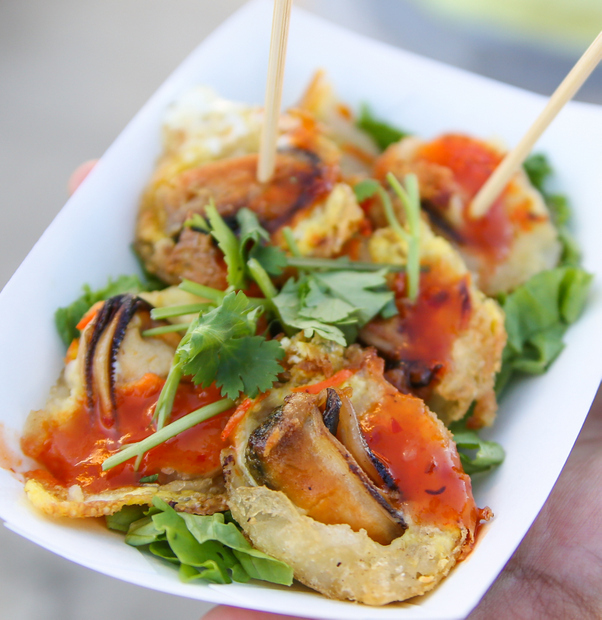 When we went to the 626 night market, the lines were long, but once you paid, the food was already ready. Perhaps next year they can let the vendors set up earlier so they can get a few dozen orders ready before the crowds are let in. We got there about 5, and the more popular vendors already had huge lines, so we stuck to vendors with short or no lines. We got steamed pork buns from Awesum DimSum. What I got of mine was good, but the child ate most of it. He loved it. 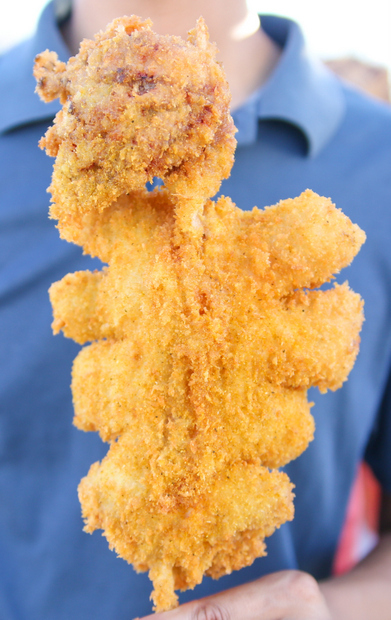 Pangea had popcorn chicken. It was alright, but could have been better had it been fried to order. We got the salted caramel from Icekimo. I liked the ice, but not so much the toppings. The child ate the banana. CaliBaguette had coconut waffles, so we got that. Again, those would have been better cooked to order. They weren’t bad, but not great. We also got some pancit and sissig from one of the vendors (didn’t get the name). It was not good. I did like that the had a larger space, but it was a little hard to find. Oh I believe the pancit and sissig were from Ed’s Filipino Cuisine. I almost forgot…we also got the scallop skewer and a lobster roll from Supernatural Sandwiches. Those were easily the best of the night, and their line moved fast. I wish it hadn’t been scheduled for this weekend. There were Oktoberfests in various cities, the Fil Am Fest, Pumpkin Fest at Bates Nut farm and Julian Apple Days as well as the Blue Angels having their night show that day. It may have been the only time available for the space, but we had to decide where to go that day, and this Night Market was eliminated from our list because of the prior year being so disorganized and crowded and booths selling out of food during the first two hours. It was good to see you did get to try so many places and that it was reasonably not crowded at the opening. Gives me more of a positive to go there next year. This weekend really was packed with events! I’m sure when they secured the date they didnt realize how many other things would be happening. But yes, things were better this time around and I’m hopeful they will continue to improve in future years. Oh I wish I knew about this event! I’m glad it was better than the previous year. I’ve been meaning to try Supernatural and all the items you ate at this event makes me want to visit their place asap. The raw (?) 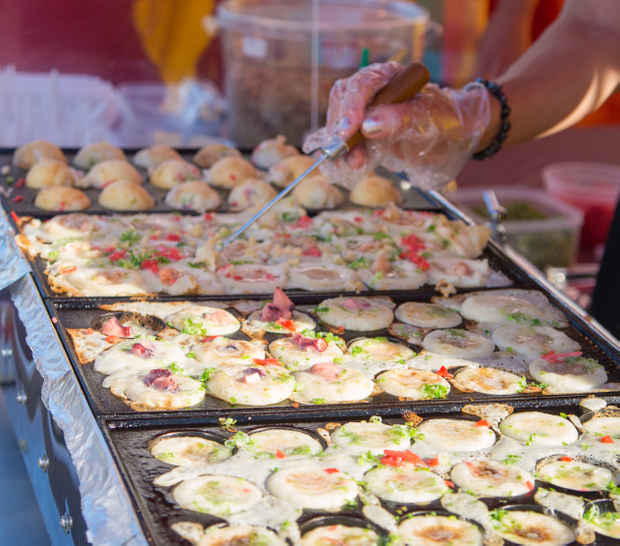 scallops look amazing – I’m glad they were safe to eat on that hot day. The scallops were cooked on a skewer. They weren’t raw. You should check out Supernatural! Dennis went here with family but I haven’t seen his pictures yet! They said similar things, like it was not busy when they got there but very long food lines by the time they left! I think he may have brought one of those ninja lollipops home… I kinda want one of those ninja bottles though! 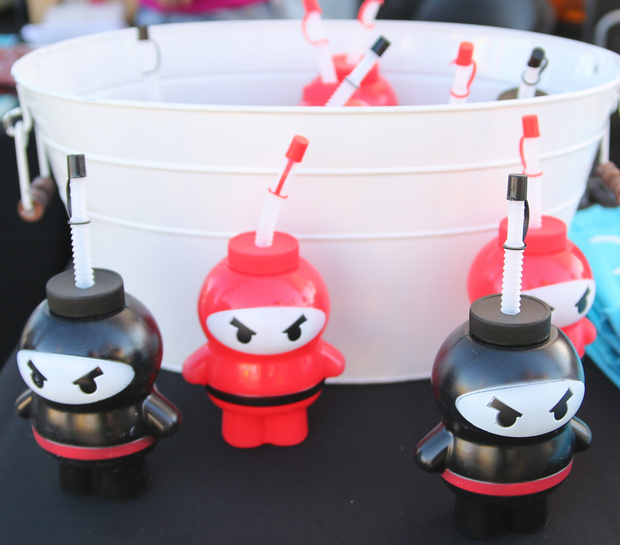 the ninja bottles were super cute! 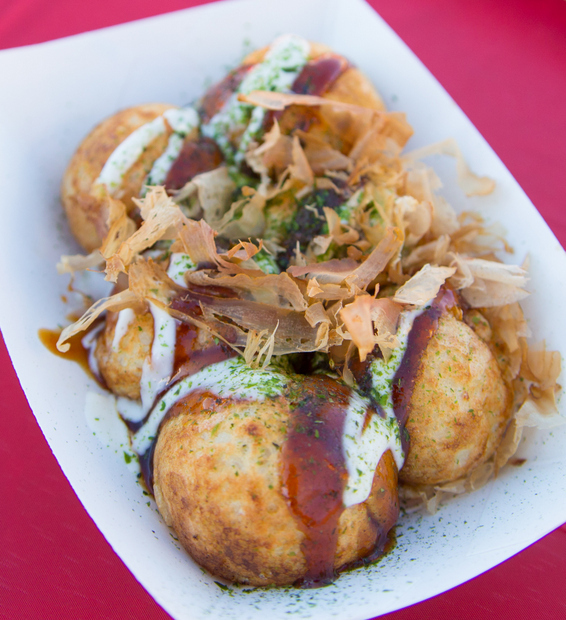 In response to the Takoyaki, I’m not sure if it is the same vendor, but I was visiting and was introduced to your Saturdays farmers market and I must say I did stop by a stand that was making Takoyaki that looked very much like the picture shown and the vendors explained the dish to me. 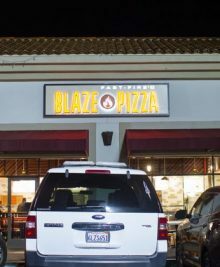 I had an exceptional experience and my servings was firm and extremely tasty in fact I highly intend on being there this year of 2015 sometime in July. When I received mine I consumed it immediately as I figured if it sat it would become soggy. I do hope that the many that reads this comment will give something new a try. They also gave me a delicious drink that had a special way of opening it. Thanks. Are you referring to the farmers market in Little Italy? I don’t believe this is the same vendor, but I could be wrong.